This is the Rody Horse with a support base for a rocking motion and is ONLY sold with a Red or Yellow Rody. The rocking base is detachable for hopping and bouncing and even more fun and play. It allows the Rody to grow with your child. The Rody Base is sold separately as item #8000. Maximum sustainable weight up to 100 lbs. Nello is a magic object and versatile, open-ended toy that quickly becomes an indispensable accessory for countless play activities, indoors and outdoors. It is a color puzzle, a nesting toy, a marble run, a floating island in the bath or a sand toy at the beach. You can roll, spin and swing the rings, throw and catch them. 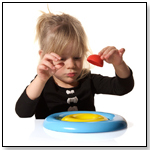 Use them as targets for games like tiddlywinks or as beautiful props for role and pretend play. Nello is made from high-quality, food-grade HD-PE, 100% recyclable. A new fun version of Miniland’s giant stacking and nesting game formed by 10 progressively sized cups. Each cup has a happy animal shape and a number in relief making it easy to stack in order. The bucket has a perforated lid with the silhouettes of 4 different shapes to match and insert 4 included shape blocks though the lid. Made for children ages 12-24 months. The Movin' Sit Jr. Air Cushion is an inflatable dynamic cushion which activates intrinsic trunk muscles to support the spine. The wedge shape encourages a seated posture with a forward pelvic position. It can also be used upright in any chair as a back support or on the floor. Adjust inflation to comfort level. 10" x 10" cushion fits perfectly in elementary school desk and other chairs. Especially designed for children. — In a February 2015 survey, six out of 11 retailers told TDmonthly that Melissa & Doug makes their best-selling wooden toys. Bebe Feimster , manager of Big Smile Toys/Hardware Center in Paoli, Pa., said these blocks do particularly well. — Donna Frederick, owner of The Play House Toy Store in Durham, N.C., told TDmonthly in a February 2015 survey that Alex's Busy Bead Maze is one of their store's best-selling wooden toys. The Support Bar is the center of all the action. The Support Bar is designed to be installed in any doorway that measures 29" to 36" wide. Extension plugs which are (sold separately) would allow the support bar to expand to 44". Our Rainy Day® Indoor Trapeze Bar can be raised or lowered to desired height to accommodate each child or moved out of the way for using the handles alone. Children love to swing, and now they can do it all year round with the Rainy Day® Indoor Playground. Ideal for families with limited or restricted access to outdoor play space. Get the support bar, trapeze bar, and strap swing in this kit to save from buying them separately! Expressions is used in the classroom with younger children – they roll the dice and then act out the the expression. It is also used with children who are shy and do not express themselves well; they can point to how they feel. The Princess Play Castle is a magical world of imagination and fun. Groom the beautiful cat at the grooming station and walk across the drawbridge to the fairytale castle with lots of pink bricks. There’s even a slide for the princess to play on. This iconic set comes in a pretty pink storage box, so it makes an ideal gift set. Use the supplied building instructions to rebuild the set into a play garden with a slide and seesaw or the princess’ royal bedchamber. Includes a princess minifigure and her cat. 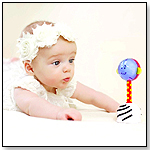 — Joe Novak, owner of Kazoo Toys of Buckhead in Atlanta, Ga., told TDmonthly in an April 2015 survey that the Noggin Stik is one of their store's top 2 best-selling infant & toddler toys. Made in Italy, the Gymnic Line’s Rody Jr. is a favorite with children for imaginative and creative play, and is also a good friend for your 18” doll. Made of heavy duty, latex-free vinyl, and is phthalate free. Is surface washable with soap and water. Rody Jr. is available in 3 colors (Light Yellow, Light Pink and Light Blue)! For ages 2 years and up, with adult supervision. Texo is the award-winning 3 dimensional design and construction system by architect, author and designer Lester Walker. 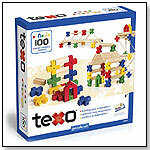 The beauty of Texo is the variety of building systems found within one toy: simple puzzles, shape sorting and color matching at its most basic level, the system allows for a gradual progression to stacking the interconnected shapes and on to advanced architectural models such as bridges, houses, skyscrapers and more! Solid wood rods and planks coupled with the geometric precision of molded plastic connectors enhance the design and construction potential. Also included is a deluxe Activity Guide with how-to’s, commentary and step-by-step instructions on maximizing the potential of Texo. These high quality Snapo building blocks are made in the USA. They SNAP together in all directions for fun, fast, creative building. Snapo blocks stimulate development of spatial and fine motor skills, connecting sideways, and you can slide and rotate them too for extra fun. Foster children’s imaginations and creative expression with our revolutionary new block design. A cube with square holes on each face, and a single, connecting stud located off-center. Unlike traditional building blocks which can only be stacked, an Artec Block can be connected in all directions. Horizontal, vertical, and even diagonal connections are possible for unparalleled ease and freedom. The possibilities are endless in the structures, animals, and shapes you can make. 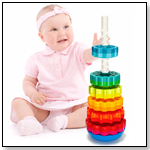 Children will be delighted by this adorable 9.5" toy featuring six removable shape-sorting and color-matching gears! Once all of the gears have been correctly placed, they will move ‘round and ‘round with a simple turn of the knob, encouraging children's hands-on exploration and discovery. And as a lively bonus, Busy Buddy’s eyes blink and ears wiggle when the gears move. For ages 9 months and up. Lace and play fun is in store. This fabulous fish lace and play character is great for play time fun or as a decoration to hang when done. Lacing activity supports the development of hand-eye coordination fine motor skills. Knock the four brightly colored balls through the holes, then watch and listen as they roll down the ramps. Sturdy wooden hammer included. — Michelle Deutschmann, owner of Kaleidoscope Toys in Falmouth, Mass., told TDmonthly in a February 2013 survey that they sold six of this item during the holidays, "which is a big number for a smaller store."